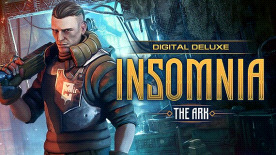 This product requires the base game INSOMNIA: The Ark. What's so special about this Deluxe set you may ask? Let's find out! You can expect to see works made by such artists as Adrian Smith, Jan Vergen, Yong Yi Lee, John Lew, Alexandr Torchinov, Vasily Hazykov and other talented individuals who helped create a unique look for the game's universe. It's not a secret that music plays a very important role in helping create games with rich atmosphere. INSOMNIA's OST is no exception to that rule. 12 ambient tracks inspired by the very best (Mark Morgan, Vangelis, Gustavo Santaolalla, Max Richter, Brian Eno) and brought to you by the incredibly talented Textere Oris will provide you with perfect company both inside and outside the game.